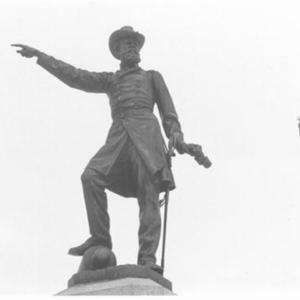 Civil War veterans and Clyde citizens had struggled unsuccessfully for more than a decade to raise funds for a memorial worthy of General McPherson, the highest-ranking Union officer killed in the Civil War. The catalyst for reaching their goal finally came in the spring of 1876. 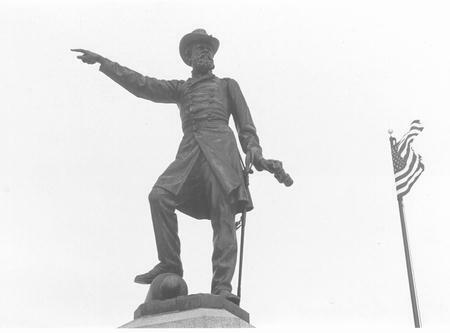 McPherson is dressed in Civil War era military attire. His proper right arm is extended and pointing to the Southwest; his proper left arm is bent at the elbow and holds field glasses. His proper right leg is forward and rests on a broken cannon while a sword hangs at his hip. 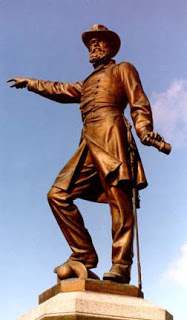 : Louis T. Rebisso, “James B. McPherson Monument,” Ohio Outdoor Sculpture Inventory, accessed April 20, 2019, http://oosi.sculpturecenter.org/items/show/423.